Welcome Referral Partners. Below are promotional tools to help you introduce Pitching Central products to your customers, email subscribers, and website visitors. I once believed a player had to have “it” in order to become a star pitcher… and I honestly believed you were either born with “it” – or you weren’t. And NONE of these transformations had anything to do with their genes. Ron has seen really solid pitchers – with just a few minor trouble spots – completely lose their athleticism and their mental game. All because they tried to use the old, conventional, “one-size-fits-all” training programs… and it killed their “magic”. And Ron has personally helped some pretty troubled pitchers identify all their trouble spots, eliminate their constraints and become truly exceptional pitchers (who landed the attention of big-name scouts and college coaches). When I changed my mindset and stopped believing the old, conventional way was the only way… truly amazing things started to happen. You too CAN become a better pitcher. 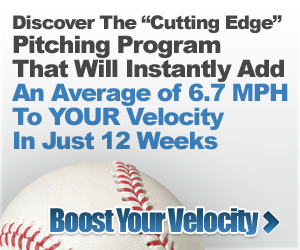 You can become a stronger, more explosive pitcher. And I can promise you one thing… you can start playing at a level that most of your other coaches and trainers don’t believe is possible for you to play at. Believe me; I have seen it happen over and over again. But the dirty little secret is that THEY can’t teach velocity. And let’s be fair here… they don’t have the time to teach you and train you to become a star player. And really, it’s not their job to teach pitchers how to throw harder, for longer – and more accurately! College coaches and MLB scouts aren’t looking for guys with great potential… or guys with a lot of heart. They are looking for guys who have “it”. And if YOU want the right people to take notice of YOU… then YOU have to put in the work and improve your pitching abilities before they ever lay eyes on you. (or else they will just skip right over you and move on to the next guy). But the biggest mistake any pitcher can make is to use a “one-size-fits-all” program. It’s not just a mistake, it can KILL your game. When you go to the Doctor, they don’t just write you a generic prescription and send you on your way.. They take the time to find out WHAT is exactly making you sick… and THEN write a prescription based on your symptoms, your needs and maybe even your allergies. When a pitcher isn’t exceptional on the mound… there is a reason. And it’s usually a very specific reason that is unique to that one player. Just like a Dr. that prescribes Penicillin to every patient – for every illness… you are going to have some patients that penicillin will work perfectly for. You are going to have some patients that penicillin does nothing for… and you are going to have some patients (people that are allergic) that penicillin can be dangerous and even deadly for. You simply CAN NOT give 10 different pitchers the same training program and expect it to fix all their unique problems. Some guys will get the results… some guys will see no improvement at all… and some guys are going to change their game so much to fit into the “one-size-fits-all” box, that they actually lose their “magic” and go backwards! You’re receiving this email because you’ve been selected and qualified as an eligible elite pitcher to order an advanced copy of Coach Ron Wolforth’s newest and most poignant book he written to date. Catch all of the details on ‘A Parent’s Survival Guide: for the Parent of an Elite Pitcher’ right HERE. This provocative book guides the most important coach in your life, your parent, through every detail of what it takes to support you and make you pitch to your full potential and make it all the way to the top. If you are not familiar with Coach Ron Wolforth, the world’s most sought after Elite Pitching Trainer, where on earth have you been hiding… look no further. This is your chance, with your pre-release copy of his book, you’ll get the secrets to his methods delivered straight to your door. P.S. When you order your advanced copy today, you’ll receive access to a private upcoming tele-seminar program with Coach Wolforth, where he’ll be presenting a special extension of his book. In the world of Major League Baseball there is a fine line between fact and fiction, between the rumors circling the bases and the sharp realty of truth about what it takes to be successful, why some pitchers make it and others are well, one pitch wonders. The only way to truly to know who’s who in our world is to hear what your peers have to say. If you are striving to perfect your game, to make it to the big leagues, and stay on the mound, you’d be smart to listen to others who have gone before you, pitchers who are on their game, now, today. “Relying on first-hand experience, in this type of arena, can be quite costly. Imagine if you could avoid injury for your son’s arm, or body? Would you want him to “learn the hard way”? Baseball is a game that requires a ton of perspective from a parent’s viewpoint. All that matters when your son is 12, or 16, or 18 is that along the development curve he has a chance to reach his potential. Regardless of what that potential ceiling is, relying on first-hand knowledge with the possibility of injury and ineffectiveness is not secure. These are just a few comments from two of Ron’s hundreds and hundreds of elite pitching athletes. If you want the edge above all others, get a copy of his new book now. P.S. The one thing about pretenders in the major leagues is they don’t last. 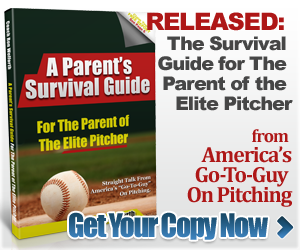 Ron’s track record speaks for itself; and now without flying across the country or paying private training fees or waiting months for results, you can get Ron’s Parent’s Survival Guide written for and about everything the Parent and Elite Pitcher needs to know. Get your copy today and step up your game like so many others have with Ron’s help, guidance, and survival methods moving from “trying to be” to “being the best”, an elite pitcher on your way to the top.